Today a column of the enemy, armed with heavy weaponry, was moving from Artyomovsk and was repelled by the Popasnyanskiy checkpoint At the same tim, near the Varvarovka settlement, where Msta-S and other heavy weaponry was located, our mortar group worked over the positions of the enemy. The enemy personnel suffered substantial losses. There were no losses on the part of our mortar group. These are the amusements that the Nazis engage in. These are the types of videos they post on the Maidan-related web sites to brag about their accomplishments. More than that, they boast about how many “colorados” and “vatniks” [Note: derogatory terms used for anti-Maidan activists and the citizens of Novorossiya] they have killed to date. And Ukrainian tank crews have a lot to brag about – they kill entire families. He has not made any further statements following his yesterday’s statement made to mass media. Anything else is disinformation. He made it clear that he remains the Commander in Chief of [the Novorossiyan] army and that, in the nearest future, he will take up the task of consolidating the disparate forces of the Militia. Battles are ongoing in the Karlovka area and on the approaches to the Donetsk airport. At 12:35 (MSK), a pair of Su jets conducted airstrikes using NARs [Noted: unguided air-to-ground rockets] against the Donetsk airport. According to some of our information, last night the airport came under DPR [Note: Donetsk People’s Republic]control. This information is currently being verified. Igor Ivanovich Strelkov made a decision [personally] to leave Slavyansk. This was effected last night. The losses of the Militia are minimal. In an organized and cohesive manner, the forces of the Militia moved out in the direction of Kramatorsk. It is expected that the transfer will continue, evidently to Gorlovka and Donetsk. This will permit us to win time, while Ukies relocate their personnel and artillery units (Ukies fight primarily by artillery shelling of peaceful cities). The advantage so gained will permit us to conclude the process of consolidating the forces of the Militia, of centralizing them under unified command, and to improve the quality of communications and logistics of the army and to strengthen the supplies of the armed forces, primarily in the area of heavy weaponry (artillery and armoured vehicles). Kutuzov once retreated as well, and there was a plan to his retreat. And, in any event, Russians retreat only before a decisive victorious battle. Right now we must improve the humanitarian support of Donbass. There were greater number of refugees on the Russian border yesterday then there were during the entire last month. According to eyewitness and Ukrainian mass media reports, 2 tanks, 3 Kamaz trucks, an APC and 15 light vehicles with militia passed along the highway from Slavyansk. Later we received information that they were located in Kramatorsk, near the Militia headquarters. Last night, there was indeed a transfer of personnel, equipment and armoured vehicles of the Militia that was necessitated by operational requirements. There were battles and the movement of large units. The clean-up of the Donetsk airport area has been almost completed by the Militia. Today, Su jets came to assist Ukie [troops]. They made four [rocket] strikes and left. Battles continue. Su jets have been observed in the Krasnoarmeysk-Donetsk area. They are shooting at the roads – probably looking for St. George ribbons. 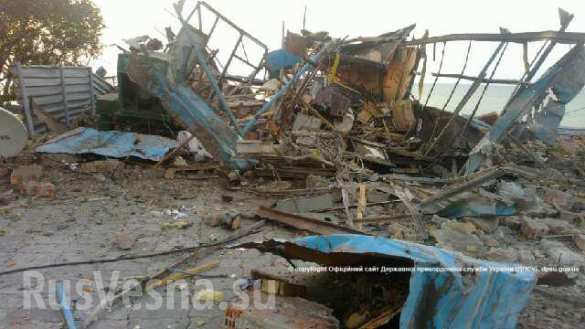 In Nikolayevka, there is enormous destruction and significant numbers of civilian victims. The information that civilian deaths have exceeded a thousand people in the last two days is receiving confirmation. There is ongoing expulsion of civilians from their places of residence in the areas where NazGuard [Note: National Guard] are being quartered following battles. In Slavyansk and other centres of resistance the forces of the Militia are being regrouped and redeployed. The information about the surrender of Slavyansk is not confirmed – the redeployment of the Militia forces is continuing. I am calling attention to the fact that there is almost no communication with Slavyansk; any statements about the actions of the Militia in the areas of the military theatre, where communications are absent, should, at a minimum, be scrutinized carefully until there is video confirmation online. In the morning, there were artillery strikes coming from the side of Krasniy Liman, closer to Raigorodok. The situation is difficult, but not critical. A [Militia] sniper, an Afghan veteran, who fought in the battle last night when Junta [troops] tried to break through into Krasnodon, is completely bewildered [by their actions]. He says that Ukies were either wasted drunk or completely drugged; in brief, it was like a scene from a movie about the Great Patriotic War, when the German [infantry] would advance, standing up straight and showering everything in front with automatic weapons’ fire. Ukies showed no self-preservation instinct whatsoever. Just like in the movies, he said. They walked without bending down at all. He personally shot at least three of them. Their personnel losses were huge. And then our tanks joined in and threw them back. Today, after lunch, you could hear our howitzers pummeling the Junta troops. Pity we have so few of them. Right not it’s quiet. 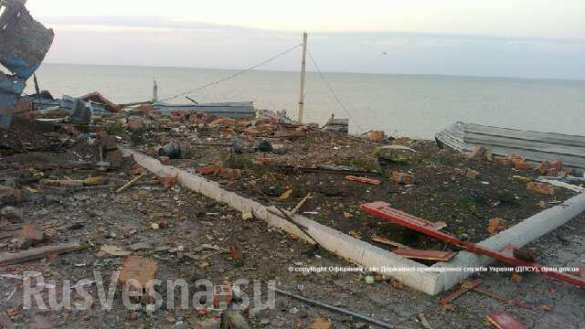 DPR saboteurs destroyed a Ukrainian border observation checkpoint on the shore of the Azov sea. On July 5, from 01:20 and until 02:15, militiamen conducted a shelling barrage against the technical inspection checkpoint on the shore of the Azov sea in the Donetsk region. The army of LPR [Note:Lugansk People’s Republic] destroyed an Il-76 and 7 APCs of the enemy at the [Lugansk] airport. In the course of the entire day yesterday, the enemy was subjective the settlements of Alexandrovsk and Bolshaya Vergunka to intensive artillery and mortar fire. Close to the evening, the detachment of the Ukrainian army, including tank units, attempt to entrench themselves in the area of Krasniy Yar, but were forced out of that location by the detachments of the LPR Army. In return, the Ukrainian forces conducted strikes against the positions of the Lugansk militiamen using Grad MLRS systems. The actions of the infantry forces received cover fire from three Mi-24 helicopters. Thereafter, the Ukrainian army attempted to assault the city from three separate directions: Krasniy Yar, Metallist and Alexandrovka. All the attacks were successfully repelled by the LPR Army. The enemy lost 2 howitzers, a mortar detail and approximately thirty men dead. On our part, the Lugansk militiamen conducted a successful operation in the area of the Lugansk airport, which is currently in the hands of the aeromobile detachments of the enemy. The enemy was shelled with heavy mortars and Grad MLRS systems, losing the an Il-76, seven APCs, a mortar detail, one anti-aircraft installation ZU 23-2, five vehicles and about a hundred fighters. The situation near Sverdlovsk remains moderately tense; the enemy is actively shelling the centre of the city; the soldiers of the Ukrainian army engage in looting and are constantly getting inebriated. According the information of the operational headquarters of the Luganks Battalion “Zarya,” NazGuard are preparing provocations in the settlements neighbouring the Russian Federation: Kruzhilovka, Davydo-Nikolskoye and Parkhomenko. The HQ has become aware of saboteur groups, wearing Militia uniforms with St. George ribbons, who might try to shell the above-mentioned settlements with mortar fire in order to undermine their trust in the LPR defenders! Also, the HQ does not exclude the possibility that the Russian Federation army may be blamed for these provocations! 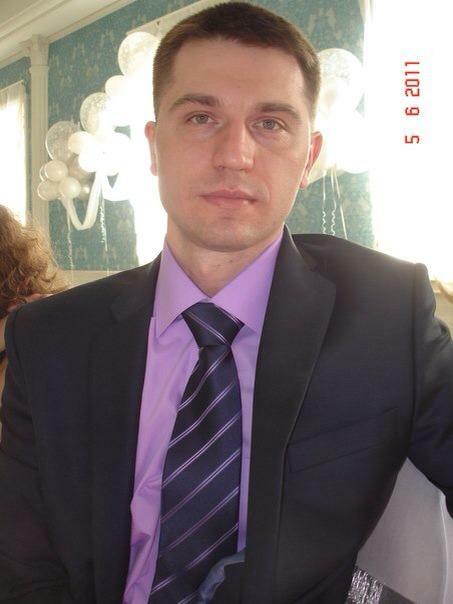 The name of the second volunteer from St. Petersburg that died in Slavyansk has become known. His name was Matvey Efremov. He is survived by a wife and three children. In the nearest future we will meet with them to tell them about what happened and to provide assistance. Vladimir Melnikov (on the photo, second from the left) had no one left; he lived alone. Before departing for Novorossiya, he left his documents and a large sum of money with friends, asking them to spend the money on the needs of militiamen in the event of his death. On July 2, I wrote that, on that day, Matvey and Vladimir died in an unequal battle during the transfer from Slavyansk to Semyonovka. They were covering the retreat of their comrades. The Slavyansk garrison has redeployed, spreading its forces among Donetsk, Kramatorsk and Enakievo. 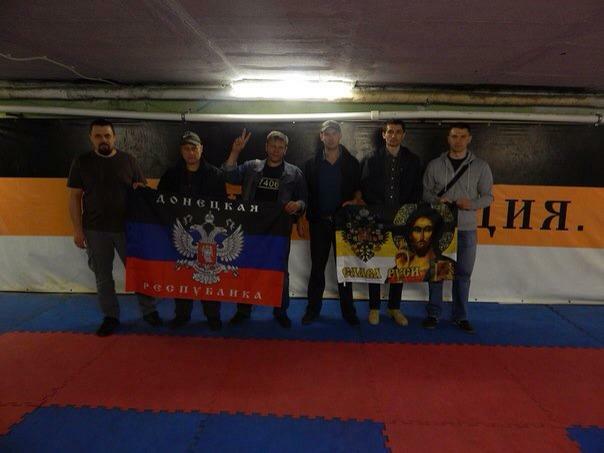 In Donetsk there very many Slavyansk militiamen, thousands. Arrests have already taken place in the Donetsk regional police headquarters, OGA. Strelkov is restoring order there. The detainees were taken outside. A much more substantial cleaning of the ranks from traitors and provocateurs is coming. There is a large number of foreign journalists. And this is very good. We need the truth to come out. The airport is ours. At this time, it is being bombed by Ukies from the air. Purgin is the only one out of the entire DPR leadership who is in Donetsk. All the rest (Pushilin, Borodai, etc.) are, for some reason, in Moscow. A RIA Novosti journalist is reporting that he saw Igor Strelkov in one of the administrative building in Gorlovka; everything is fine with him. The detachments that were formerly deployed in Slavyansk are also in the city; a part of them is already in Donetsk. At this time, the situation in Gorlovka is calm. The forces of DPR, taking into account the insurmountable numerical superiory of the Ukrainian military, were forced to leave their previous positions on the northern part of the front and to redeploy to the positions previously prepared. In an organized fashion, and retaining their personnel and their weaponry, our armed forces have entrenched themselves at the reserve defence positions. We were prepared for this eventuality, as we are forced to confront a grouping numbering several dozen thousands of men and hundreds of armoured vehicles – in other words, the entire battle-worthy Ukrainian army. Our armed forces continue to fight; their morale is high, and we are confident in our abilities. It is relatively calm in Donetsk now. 18:35 (MSK) – For several hours now, artillery from Karachun has been shelling some of the Slavyansk districts. A pair of Su jets performed sorties in the area of the quarry near Krasnodon. Another pair flew over Krasniy Liman. In the course of the battle at the Lugansk airport, an Il-76, 7 APCs, a mortar detail, an anti-aicraft gun, five vehicles, and over a company of troops were eliminated. 19:45 (MSK) – Loud explosions heard in Lugansk, in the area of Metallist-Shchastye. 20:00 (MSK) – Heavy artillery shelling of Slavyansk is ongoing. Part of the Artyom district and the districts of Lesnoy, Severniy and Tselinnaya are being targed. There have been over a hundred volleys as of this hour. Automatic weapons’ fire can be heard in the city. There is such a concept as a military stratagem: there is much that cannot be made public that happens on the battlefield. Time may come when much becomes known or is revealed. In his time, Kutuzov surrendered Moscow, so as to later smash Napoleon head on. Motorolla, Babay and Strelkov are alive; and, however it may sound, a decision was made to abandon Slavyansk. The main reason for this decision is the salvation of the civilian population. The problem is that the nightly and daily shelling of Slavyansk by the Ukrainian army, using MLRS, was a serious threat to the remaining population in Slavyansk. That which the fascists did to Nikolayevka was a very real fate for Slavyansk. However, in the fascists’ place I would not be calm in the streets and behind the walls of Slavyansk. They will soon understand this. At this time, what is truly important is to same the lives of as many Donbass people and the militiamen as possible; a human life, and I mean specifically human, not fascist – is what is most precious. Redeployment is almost over and the main battles are still ahead. Victory will be ours, it will be Novorossiyan! Ukrainian military sent supplies, equipment and uniforms to their soldiers via private postal service. The militiamen found this out, and, now, extend their deepest gratitude for the gifts. 22:30 (MSK) – Tselinnaya is burning; maneuvering battles are ongoing; Rex’s guys are working. According to unconfirmed information, there are still several Ukrainian tanks on the outskirts of Kramatorsk. They are not entering the city; looks like they may be waiting for fresh underwear. Serious problems with telephone communications continue in the areas of the military theatre. 23:05 (MSK) – They are hitting Karlovka from Galitsinovka and Zhelannoye; the artillery cannonade is very intensive. 23:15 (MSK) – Artillery fire coming from the Izyum side, directed at Krasniy Liman. Something is burning on the outskirts of Krasniy Liman. Igor Strelkov: Advancing against us are real fascists, fascists in the very same sense that our predecessors understood this word. Monsters. Murderers. Bandits. Marauders. Pure Polizei. Banderovtsy, just as they once were. Q: What happened today? This is the key question that all of us, without exaggeration, want answers to. Igor Strelkov: Last night, we effected a breakout from within a closing enemy ring, which was, in fact, already closed off. We performed a diversion against the positions of the enemy at the “Slavyansk” stella [Note: the Slavyansk city sign]. Our armoured group conducted the assault. Unfortunately, and I will not hide it, the larger part of armoured group was eliminated in the course of the attack. This was so not so much connected with ... well, regrettably, this was an error on the part of the commander of the armoured group led to this. He made a wrong decision in carrying out his assigned task. Nevertheless, between 80%-90% of the personnel and 90% of the armaments were transferred out of the city. The number of dead and wounded is not that great, we have confirmed it. As well, we were able to evacuate a significant number of the families of our servicemen and other individuals that helped us, for whom to remain in the city was life threatening. The breakthrough took the enemy completely by surprise. We adopted the necessary concealment measures. In that regard, we are awaiting those heroes that are now breaking through on their way to us, who gave us fire cover as a distraction from the trenches and demonstrated our presence on the defence positions. Q: Igor Ivanovich, this deals with the outcome of what happened, but many are equally concerned about a plan for the future. Igor Strelkov: We will continue our military activities. We will try not to make the mistakes we made in the past. These errors, in reality, were not mistakes as much as simply the consequence of a blatant lack of weapons and of ammunition. We hope that we will be able to prepare for the next enemy offensive in a more diligent manner and without giving the enemy the opportunity to capture the key strongholds that they were able to take over so easily when we had only a few automatic rifles to our name. Q: Some have claimed that your have apparently abandoned your responsibilities and removed yourself from your role, that you have even fled to Crimea, to Krasniy Perekopsk. Have your resigned or not? Igor Strelkov: (smiling) Well, if this [around us] were Crimea or Krasniy Perekopsk, then, well … I don’t know … I guess so … But I am currently in Donetsk. In addition to my direct duties I plan to create, tomorrow, by my Order as the Minister of Defence, a Central Military Council, which will include all the key field commanders, independent of their direct responsibilities, and where we will coordinate all questions related to the defence of the Donetsk People’s Republic and, possibly, in part, those dealing with the Lugansk People’s Republic, provided they are within our jurisdiction in the military theatre. And, moreover, until one is appointed, I will be performing the functions of the Military Commandant of the city, as well as those of the commander of the city garrison. In other words, we will be preparing Donetsk for active defence, to ensure that it is not taken over by the enemy. Well, at the very least, as much as we did in Slavyansk, and certainly much more. In reality, with sufficient troops, Donetsk is much easier and more convenient to defend than the small city of Slavyansk. Q: A final request. Regardless of how strongly I may sympathize with your circumstances, as a journalist, I have a duty to ask this question: with respect to those who remained in Slavyansk, what can you tell those people who stayed behind? Igor Strelkov: (sighing deeply) First of all, I would like to ask them for their forgiveness for failing to retain the city. Our decision to break out of the city, not to die there, was motivated not only by a desire to save the garrison itself, which is natural for any commander, but also by the fact that we realized that we could not hold it, and that, meanwhile the city would be subjected to ever greater destruction and suffer even more victims. Right now I am receiving information that, just as was expected, unfortunately, despite the fact that we evacuated the majority of those who helped and volunteered with us, the enemy has engaged in a massacre there. In Slavyansk, in Kramatorsk and in Nikolayevka. Because today, pursuant to my order, we also withdrew our garrison from Kramatorsk. The battalion that defended it has been redeployed here, to Donetsk, in order to reinforce our positions. Defending it became entirely futile after the enemy had taken Artymovsk. It would simply have led to another city being encircled. In any event, of course, the information that they engaged in a massacre there, first in the Artyom district, I am waiting for confirmation of it, but I already have several sources reporting the same information, that the NazGuard [Note: Ukrainian National Guard] exacted vengeance for their numerous losses on the people [of Slavyansk]. All the same, our endeavour to avoid victims among the civilian population did not save the population from being victimized. This just further confirms, for those who believe that, if the Militia leave without putting up a fight, it would save them from repressions, that it would not save them. Advancing against us are real fascists, fascists in the very same sense that our predecessors understood this word. Monsters. Murderers. Bandits. Marauders. Pure Polizei. Banderovtsy, just as they once were. Despite the fact that eighty years have passed. Not eighty, seventy. They are genuine Nazis that hide behind the ideas of “United Ukraine” to perpetrate ethnic cleansing. And they are effecting it. And that is why we will be resisting in Donetsk just as we had been resisting them in Slavyansk, only far more successfully.